What is the worst that can happen? The question I ask myself every time I’m about to do something that scares me terribly. The answer mostly is: I die a painful dead. Since I’m only a real daredevil once upon a blue moon, I most likely won’t be more at risk of dying than normally. What I am at risk of however is having a negative outcome of some sort. Which still is not bad. The worst that can happen is not doing it and wishing I had. I’ve noticed that the things I have done and had negative outcomes did not haunt me as much as the things I did not do. The negative outcomes were quickly, relatively speaking, followed by an “Ohw well”. Or my preferred term for giant bloopers “Oops”. The things I had the opportunity to do and didn’t are still haunting me. Still passing my mind once upon a time depending on how long ago it was. It seems as if there is something unresolved that desperately needs solving. Since time travel is still unavailable, I can’t go back and fix my past, but my future is arriving one day at a time. 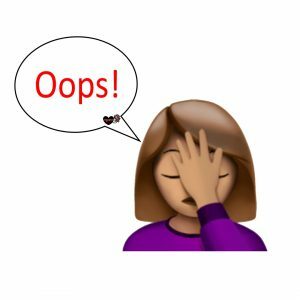 I can fix my future by adapting to a life of “Oops”. Now I’m not saying to make one giant blooper after the other, than you might actually die a painful dead. I am however saying to dare to make an “Oops”. To take on the opportunity as it presents itself, without fear of a negative outcome stopping you. Your moments of “Oops” are signs that you’re living life and not just being alive. There’s life in every “Oops”. 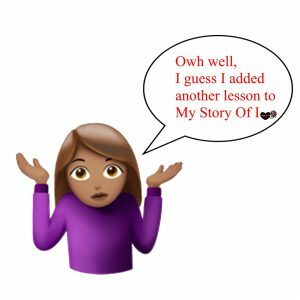 Hopefully there is something to learn in every “Oops” as well, else it’ll always make one hell of a story after some time. Emphasis on the ‘’after som time’’. Don’t be scared of a life of “Oops”. You can’t get to greatness without stumbling a few times.